Thunderstorms with their squalls and risk of lightning strikes have frightened sailors from the beginning of time. In Greek and Norse mythology, it is not surprising that Zeus and Thor, gods of thunder and lightning, were such dominant and feared figures. Nowadays we know, rather more prosaically, that showers and thunderstorms are caused by convection and that there is a random element in their development. As a result, detailed forecasting is impossible. To understand what is behind them we must know a little about how convective clouds work. Convection occurs when the air is unstable; that is when localised heating causes bubbles of air to rise from the sea or land. This is rather like when you put a pan of water on the hob and watch the bubbles rise. As bubbles in the atmosphere rise, they expand and cool; if they cool enough, water will start to condense. That releases heat � latent heat to those with long enough memories of their O-level physics. The temperature at which this happens is called the dew-point � for obvious reasons. The result is cumulus clouds and, because the dew-point is fairly uniform over a wide area, the clouds will form at nearly the same height. Cloud base is typically 1000 to 1300 m (roughly 3000 to 4000 ft) in our latitudes. When they first form, cumulus, or heaped cloud as the textbooks often describe them, are small, fluffy looking clouds much loved by artists such as Constable. Water drops in them small bubbly clouds do not have time to grow big enough to fall out and reach the ground as rain. Even quite large convective clouds will not give any rain because the up-draughts are too strong for even the larger drops to fall out. Watch such clouds and you will see that bubbles are continually bursting out of the tops. As they do so, the water in them starts to evaporate in the dry air outside the cloud. That cools the air � a latent heat effect again - and the cloudy bubbles disintegrate while subsiding down the outside of the cloud. Just left of centre, a bubble emerging from the cloud top is toppling over as more bubbles emerge. The tops of these large cumulus clouds can be several kilometres high and with temperatures well below 0�C but the drops will still be liquid water. If they are small enough, drops may remain liquid even as low as -40�C. Sometimes, perhaps late in the day, the convection weakens and, although the clouds are not very deep, the water drops may just get large enough to fall and reach the ground as very light, short-lived showers. 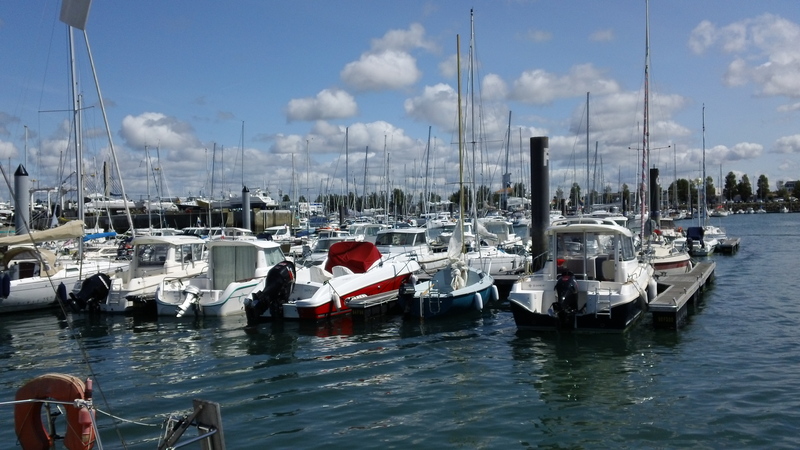 We saw this on several days around the Vend�e and south Brittany during the �summer� of 2012. 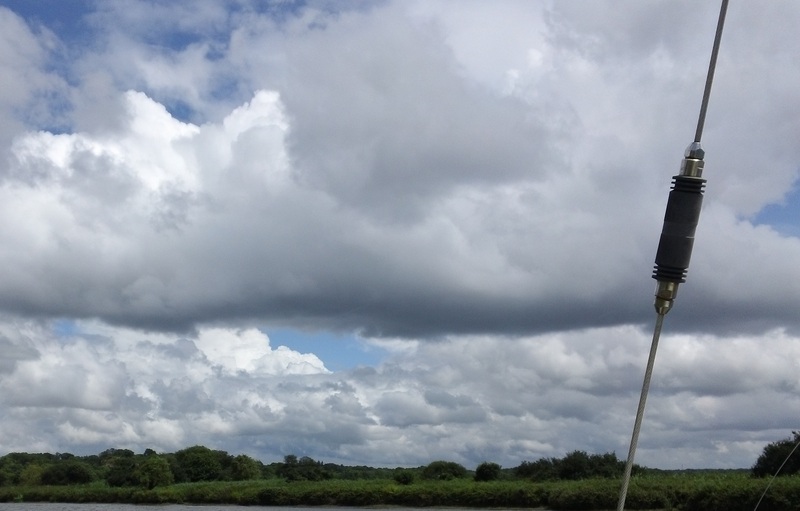 These fairly shallow cumulus clouds, seen up the Vilaine river, gave a few spots of rain. If large cumulus clouds grow large enough, the chance of heavier, longer-lived showers increases. This follows, the freezing of water drops although just how this happens varies from day to day depending on the aerosol content of the air. Some small particles seem to stimulate freezing more easily than others; these may be natural, sea salt or fine sand, for example, or man-made industrial pollution. 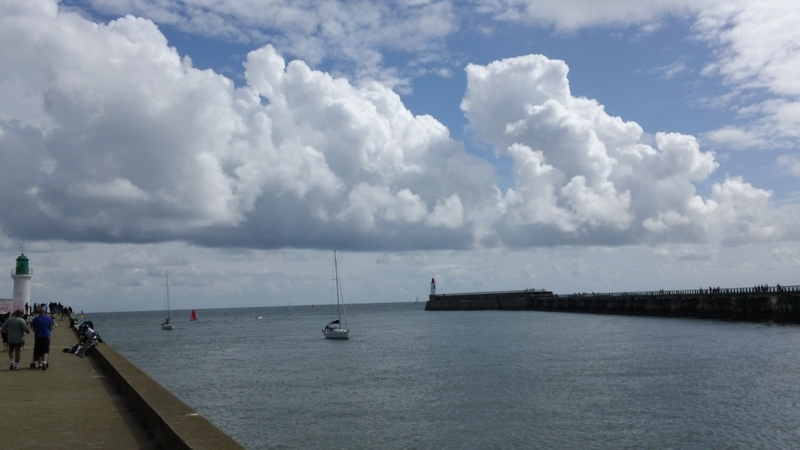 Watch large cumulus clouds carefully and look out for a change in appearance at the top. If the cloud drops start to freeze they stop evaporating and bubbles will stop descending around the cloud while the tops become less well defined. This freezing has several consequences. As the drops freeze, they give out more (latent) heat giving a longer lease of life and enabling a cloud to grow to heights, up to 10 to 13 km (30,000 to 40,000 ft) in our latitudes and considerably more in the tropics. The frozen drops grow more quickly than those that are still water and start to fall, colliding with other ice particles and sweeping up drops of water. Growth can be rapid so that they may reach the ground as hail or melt to become heavy rain showers. While colliding with ice particles, some electrons are transferred to the hail giving it a negative charge. The smaller ice particles that have lost electrons gain a positive charge. In these heavy showers, positively charged small drops or ice particles are left in the cloud top while the hail carries a negative charge to the bottom. That negative charge induces a positive charge at ground or sea level. 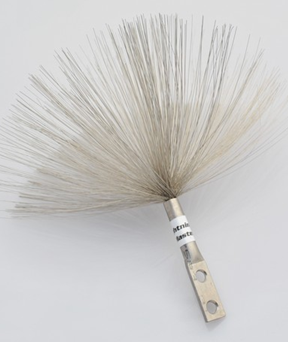 The differences created in electric charge act like two pieces of wire from the positive and negative terminal of a battery; If there is a big enough difference between positive and negative, or they are close enough, the sparks will fly. On the atmosphere scale these sparks are gigantic; that is what we see as lightning. Differences in electric charge caused by the falling ice particles leads to the sparks flying. The electrical discharges can be cloud to ground, within a cloud or between clouds. Contrary to popular thinking, there is no difference between forked and sheet lightning. If you see it directly from cloud to ground or between two clouds, you see the path taken by the strike as the discharge ionizes the air. If the strike is within or behind a cloud, the light is diffused and is called sheet lightning. In a large cloud like the one shown here there will be many millions, even billions of tones of water; the energy required to produce such a cloud is around one H- Bomb�s worth. That energy comes mainly from the release of latent heat at the condensation and freezing stages. Can we protect against lightning strikes? A lightning strike on a yacht is quite likely to, knock out all the electrics and electronics, even those devices that have been switched off. At worst, it can cause severe structural damage. Total protection against lightning is virtually impossible. Sailors used to be advised to carry heavy chains to wrapped around the mast and trail into the sea when storms were near. That never sounded feasible on a small boat but, luckily, strikes are pretty rare although avoidance is always likely to be better than trusting to luck. Having a tall mast pointing upwards always seems to be a hostage to fortune. One precautions that we think is worth taking is to fit a Lightning Master �bottle brush� at the top of the mast. In 2004, we were to the south of Sicily when we saw fishing boats scurrying to the nearest harbour at Sciacca. The Italian Met service forecast had said �Temporali isolati�. Maybe they were isolated but out of the mist loomed an enormous thunderhead and Anhinga, our Hallberg Rassy 34, was right underneath it. We, had a most frightening, unpleasant close encounter of the worst kind. It was so close that we could hear the air being ionized by the lightning strokes but suffered no damage. All we saw was one flick of the Raymarine ST60 wind indicator but nothing else. From previous experience of being near lightning, we are fairly sure that the Lightning Master, fitted earlier that year, had probably saved us. That might have been money well spent. Bolted to the top of the mast, this passive device is intended to prevent a charge building up on a single point. The theory is that any electric charge leaks away to a good earth such as the sacrificial anode. Ours is clearly shown on the photo of Anhinga. A sensible precaution when lightning is around is to put all mobile electronic devices in the oven. This will act as a Faraday cage and probably protect your cell phones, laptops, tablets, Hand-held GPS and digital cameras. Can we avoid lightning strikes? One option is to stay in harbour whenever heavy showers are in the forecast, particularly when the dreaded word thunder is mentioned. 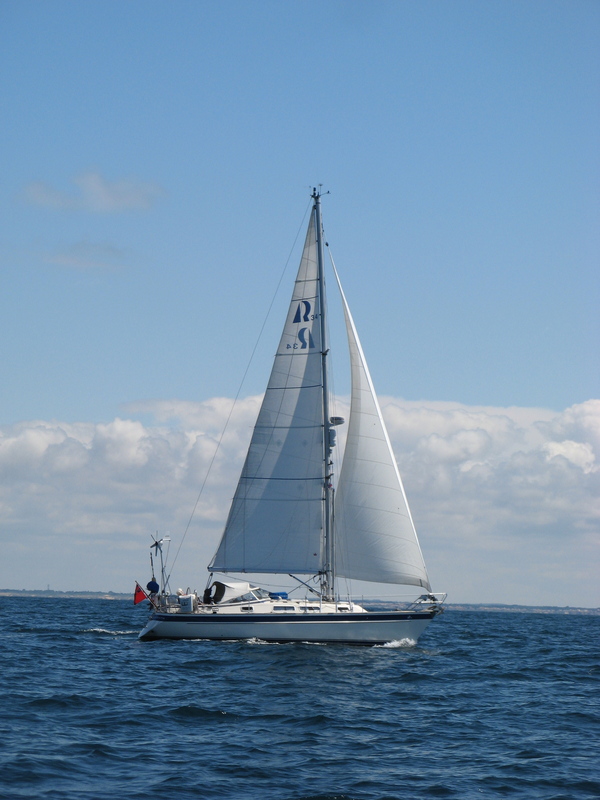 However, even that is not 100% safe; even with other taller masts around, you may just be the unlucky one. In any case, that would keep us in port on many unnecessary occasions. The creation of showers will always be associated with a separation of electric charge within the clouds but there may not be a large enough difference in charge to lead to lightning. Over the Hebrides, there are less than 4 days a year on average with thunder. On the other hand, over Kent, there are over 14 days a year on average. The difference is because thunderstorms over southeast England are most likely when there is warm air from the south with a high water content. Over the Hebrides, showers are most likely in north-westerly airstreams. These are in relatively cold air with a much lower water content. That is a start and could be the basis of a rough and ready rule of thumb. We can do a little better by assessing the risk objectively using CAPE. The name will be known to those who use zyGrib to get NOAA GFS GRIB data as it will be to users of the WeatherTrack and Weather4D iPad GRIB Apps. Convective Available Potential Energy is a measure of the energy that can be realized if there is enough heating to give convection. The values are given in Joules per Kilogram of air but the pictorial representations are good enough for our purposes. The greater the energy that is released during convection, the greater will be the charge separation and the more lightning is liable to occur. zyGrib is no longer supported although it will continue to function. An improved service is XyGrib, a fork of zyGrib. XyGrib will be updated from time yo time. It will be expanded to be able to decode other GRIB formats. When the CAPE index is zero, the air will be stable and convection is not possible. For CAPE values up to about 1000, the probability of heavy showers increases. The table gives a rough guide of the likelihood of lightning when using CAPE charts. 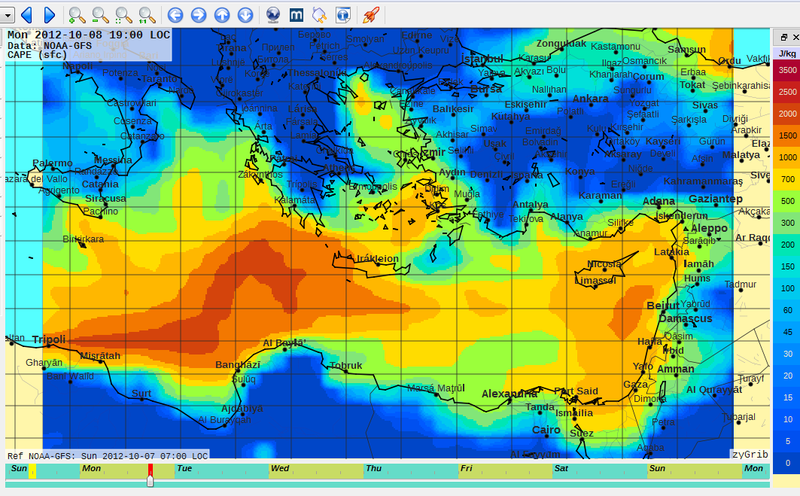 The example shows a prediction of CAPE for the Mediterranean at 1800 on Monday 8 October, 2012. There would be zero probability in the areas shown in blue areas; a slight probability in the yellow areas but increasing likelihood of lightning as the colours deepen to red. A zyGrib prediction of CAPE. The prudent sailor would try to avoid the area east of Tripoli, near the coast of North Africa. Synoptic charts showed a rather weak looking trough of low pressure. As ever in meteorology, little is ever simple or straightforward. Thunderstorms and lightning can also occur close to active weather fronts, especially cold fronts or occlusions. Listen to the forecast; at any mention of heavy or thundery rain, take a look at CAPE. You may not always get it right; you will lessen the chances of getting it wrong. Good luck. Remember that going for a walk without a raincoat may be unpleasant but going sailing without your CAPE might be dangerous.